Cruise from California through the Panama Canal to Florida, one of the man-made wonders of the world. The canal is 100 years old but is still an awe inspiring engineering feat, and the best way to experience it is on a cruise. 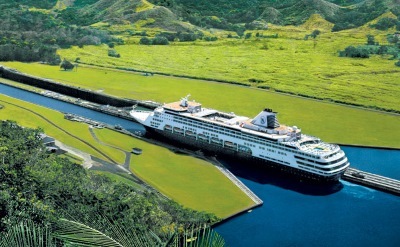 Panama Canal cruises depart from Los Angeles, San Diego or San Francisco. They finish in Florida in Miami, Fort Lauderdale or Tampa. 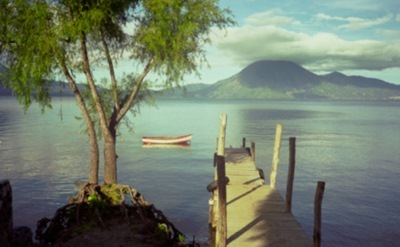 On your journey you'll visit tropical ports in countries like Mexico, Costa Rica and Colombia. 15-day Panama Canal cruise on Holland America Line. One-way from San Diego to Fort Lauderdale (Florida). 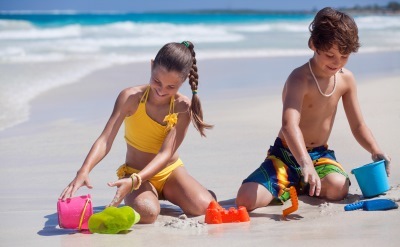 Visit Puerto Vallarta (Mexico), Huatulco (Mexico), Puerto Quetzal (Guatemala), Corinto (Nicaragua), Puerto Caldera (Costa Rica), the Panama Canal, Cartagena (Colombia) and Half Moon Cay (Bahamas). 15-day Panama Canal cruise on Princess Cruises. One-way from Los Angeles to Fort Lauderdale (Florida). Visit Puerto Vallarta (Mexico), Huatulco (Mexico), San Juan del Sur (Nicargua), Puntarenas (Costa Rica), the Panama Canal, Cartagena (Colombia) and Aruba. • 2019 departure: April 5. 15-day Panama Canal cruise on Carnival Cruise Line. One-way from Long Beach to Tampa (Florida). Visit Cabo San Lucas (Mexico), Puerto Quetzal (Guatemala), Puntarenas (Costa Rica), Panama Canal, Cartagena (Colombia), Santa Marta (Colombia) and Grand Cayman (Cayman Islands). 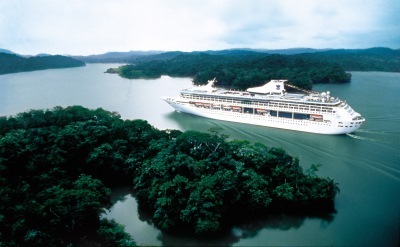 15-night Panama Canal cruise on Regent Seven Seas. One-way from Los Angeles to Miami (Florida). Visit Ensenada (Mexico), Cabo San Lucas (Mexico), Zihuatanejo (Mexico), Acajutla (El Salvador), San Juan Del Sur (Nicaragua), Puntarenas (Costa Rica), the Panama Canal and Cartagena (Colombia). 16-night Panama Canal cruise on Royal Caribbean. One-way from Los Angeles to Fort Lauderdale (Florida). Visit Cabo San Lucas (Mexico), Puerto Vallarta (Mexico), Puerto Quetzal (Guatemala), Puntarenas (Costa Rica), the Panama Canal, Colon (Panama), Cartagena (Colombia) and Grand Cayman (Cayman Islands). • 2019 departure: October 30. 21-day Panama Canal cruise on Norwegian Cruise Line. One-way from Los Angeles to New York. Visit Cabo San Lucas (Mexico), Mazatlan (Mexico), Puerto Vallarta (Mexico), Puerto Quetzal (Guatemala), Puntarenas (Costa Rica), Cartagena (Colombia), Santa Marta (Colombia), Aruba, Curacao and St Maarten. 14-night Panama Canal cruise on Disney Cruises. One-way from San Diego to Galveston (Texas). Visit Cabo San Lucas (Mexico), Puerto Vallarta (Mexico), the Panama Canal, Cartagena (Colombia), Grand Cayman (Cayman Islands) and Cozumel (Mexico). • 2019 departure: November 8. 15-night Panama Canal cruise on Celebrity Cruises. One-way from San Diego to Miami (Florida). Visit Cabo San Lucas (Mexico), Puerto Vallarta (Mexico), Puerto Quetzal (Guatemala), Puntarenas (Costa Rica), Panama Canal, Colon (Panama) and Cartagena (Colombia). 15-night Panama Canal cruise on Royal Caribbean. One-way from Los Angeles to San Juan (Puerto Rico). Visit Cabo San Lucas (Mexico), Puerto Vallarta (Mexico), Puerto Quetzal (Guatemala), Puntarenas (Costa Rica), the Panama Canal, Cartagena (Colombia) and Orangestad (Aruba). 13-day Panama Canal cruise on Carnival Cruise Line. One-way from San Diego to Miami (Florida). Visit Huatulco (Mexico), Puerto Quetzal (Guatemala), Puntarenas (Costa Rica), the Panama Canal, and Cartagena (Colombia). • 2020 departure: February 1.